An inventor's process is influenced by a variety of ideas, resources, and people. When people think about how inventors work, they often imagine that inventors begin with a need and then move through a sequence of steps from conceptualization to experiments and finally to marketing. While such a model is orderly and linear, it does not necessarily reflect how inventors actually go about their creative work. 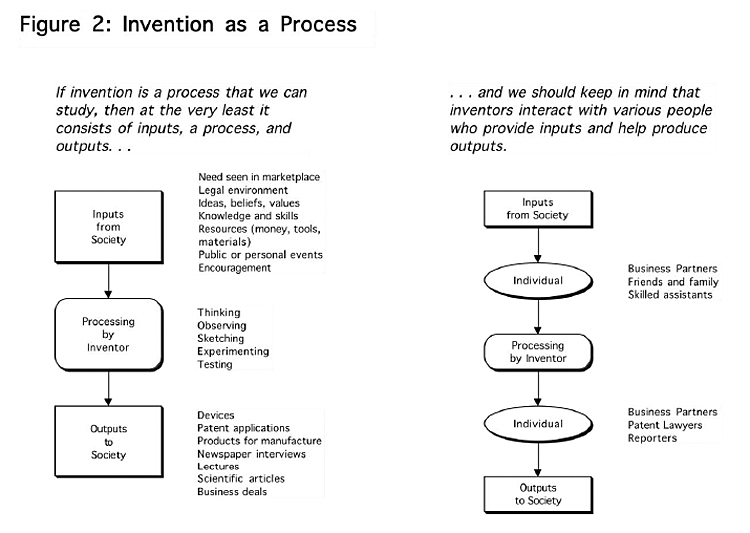 This report describes an alternative model which seeks to highlight three aspects of the invention process: the activities that an inventor may use to develop inventions; the people, ideas, and resources that may influence an inventor; and all of the results that may be produced (products, patents, and publicity). While the model employs several categories, these categories are sufficiently flexible so that the model can capture the differences and nuances of how different inventors work. By creating diagrams that represent these categories, this model can be used by historians, curators, and archivists as a tool for reconstructing an inventor's work from the documentary record. It can also be used to prepare for oral history interviews, for the acquisition of inventor's records by museums and archival repositories, and by historians researching and interpreting written/primary sources as they relate to creativity. In 1997, the Lemelson Center gathered together an ad hoc group of archivists, curators, and historians to develop plans for documenting the invention process [Lemelson Center, “Understanding Invention and Innovation: A Documentary Study,” last updated 8/25/98.]. As part of their efforts, this group developed a model of the invention process which was used to generate questions and ideas about what sort of materials the Center should collect in order to document the creative work of inventors. 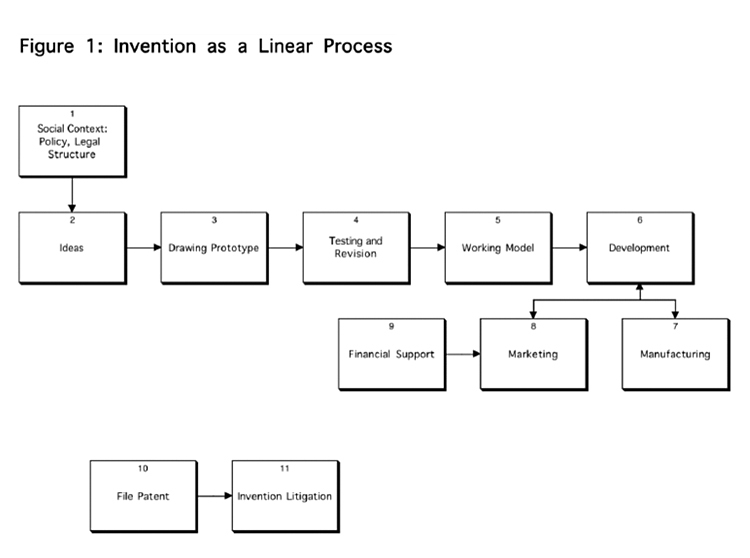 In so doing, the group created a model of invention that was similar to the block diagrams often used to describe the design process in textbooks on engineering or entrepreneurship. This model is summarized in Figure 1. A distinction is drawn between the technical work that occurs in the middle steps and marketing, which comes at the end. Inventors are often doing both technical and marketing work all the time. Overall, the model is linear, suggesting that inventors move through a specific sequence of activities, with no false starts or backtracking. As Eugene S. Ferguson observed in his study of design and technological creativity, “Block diagrams imply division of design into discrete segments, each of which can be „processed‟ before one turns to the next" [Eugene S. Ferguson, Engineering and the Mind’s Eye (Cambridge: MIT Press, 1992), 37. 3 Thomas P. Hughes, American Genesis: A Century of Invention and Technological Enthusiasm, 1870-1970 (New York: Viking, 1989), 13-95.]. While a linear model like this may be useful for introducing students to design and entrepreneurship, this sort of model is problematic for historians and scholars studying how inventors actually work. Because of the embedded dichotomies, the model assumes that all inventors use the same activities and follow the same sequence of steps. For historians intent on understanding the details of the invention process, using this sort of “one-size-fits-all‟ prescriptive model can seem like jamming a square peg into a round hole. Consequently, I began to wonder if it would be possible to create an alternative model of the invention process, one that softened these dichotomies, recognized how inventors are influenced by a variety of ideas, resources, and people, and highlighted their day-to-day activities. Would it be possible to generate a non-linear model, and perhaps, as a result, capture other elements of the creative process and other ways that invention is social and cultural? An alternative, non-linear model would reflect much of the literature on invention and creativity that has appeared in recent years. Scholars such as Thomas P. Hughes have emphasized that inventors develop individual methods and styles and that they intermingle the social and technical throughout their work.3 Indeed, I would argue that what makes inventors important and interesting is their willingness to have one foot in the technical world and the other in the business or social world; their creativity is building bridges between the two. Moreover, scholars have come to see invention less as an outcome—an invention—and instead as more of a series of activities or a process. To develop an alternative model, let‟s start by being clear about what it means to be talking about invention as a process. When we say invention is a process, we are shifting from thinking about invention as a Eureka moment in which an inventor suddenly has a great idea. What makes Eureka moments so dramatic is that change is portrayed as being instantaneous, discontinuous, and non-rational. Instead, when we talk about invention as a process, we are suggesting that invention takes place over time and is the result of the inventor doing things—thinking, building models, sketching, and conducting experiments. Moreover, if thinking of invention as a process, then like other processes, we can consider that invention has both inputs and outputs. [Figure 2] In terms of inputs, what does an inventor use in the course of his or her work? Besides tangible resources (money, tools, and materials), he or she also relies on other individuals to provide help with essential tasks, such as model building, patenting, and marketing. And of course, an inventor draws on a whole range of intangible resources including pre-existing knowledge (both science and other fields), needs seen in the marketplace, legal expertise (patents, regulations, and contracts), as well as emotional support and encouragement. Inventors may also be influenced by public events (such as wars or business conditions) or their personal situation (love, marriage, health, emotional depression), and so these should be included as inputs. In terms of outputs, we expect inventors to produce devices and patent applications, but they also need to promote their creations. Hence, the outputs from the invention process should include interviews, lectures, and publications. And since inventors may sell or license their creations, so we should list business deals. While an inventor can bring some resources into the creative process on his own (for instance, he can read the technical literature or study needs in the marketplace), these inputs and outputs often come into the invention process as a result of the inventor interacting with other people. These individuals can include business partners, skilled assistants, family and friends, patent lawyers, and newspaper reporters. All of these intermediaries affect how ideas, resources, and results flow in and out of the invention process. By considering the inputs and outputs to the invention process and by highlighting the individuals with whom inventors interact, we are taking an important step toward contextualizing the invention process. We are showing how inventors draw on their social environment and at the same time how they seek to shape it. Along with thinking about invention as a process, we also need to consider what an inventor does when he or she is inventing. While the inputs and outputs help us connect the inventor to the larger, outside world, we need to explore what‟s going on inside the inventor‟s head or on the laboratory bench. If we look around an artist‟s studio or an inventor‟s laboratory, what do we find? Both creative spaces are filled with models, sketches, and notes as well as machines or paintings in various stages of development. Using all these things, an artist or inventor is trying to merge abstract ideas in the mind with objects in the real world. On the one hand, an inventor may have an idea about how to invent something, and he or she struggles with how to build a device that realizes that idea; on the other hand, an inventor may experiment—indeed, play—with a device to see what new ideas it produces. An inventor may move from idea to object as well as from object to idea—the point here is that invention is about merging ideas and objects. While it is easy for us to imagine an inventor tinkering with a device on the benchtop, this is not the only way that he or she can mingle ideas and objects. He or she can do the same with a variety of substitutes—rather than make a full-scale version, an inventor might use a prototype, sketch, series of calculations, computer simulation, or even a written description. The advantage of these substitutes is that often they can be generated more quickly and manipulated more fully than the full-size device. Edison, for example, filled hundreds of notebooks with sketches because through sketching he could often determine whether a device would work and then avoid having to build each and every device that he thought of. Because these substitutes—the prototypes, sketches, calculations, and written descriptions—can stand in place of the fully-developed invention, one can call them representations of an invention. Suppose you allow each permutation of an invention—each prototype, model, sketch, or experiment—to be represented as a box. [In using the model, this box can be on a piece of paper, drawn on a computer, or a Post-it® Note on the wall—it doesn‟t matter.] You can place these boxes in chronological sequence; in Figure 3, time moves horizontally, from left to right. One advantage of arraying the representations in chronological order is that you can look for cause and effect. In some cases, one sketch prompts an inventor to produce another sketch or model, and you can capture these connections by drawing arrows between the boxes. In addition, you can arrange the boxes in different rows, with each row representing a line of investigation or particular invention. An inventor may have several lines of investigation going on at any time, and he or she may move an idea or device from one line to another. In the cognitive science literature on creativity and discovery, this collection of lines of investigation is called a network of enterprises. In fact, a key part of creativity may be the ability or willingness to move ideas and objects from one line to another—to mix things up in unexpected ways. Like other creative people, inventors strive to generate a steady stream of ideas and representations, to study them, and to shape these ideas into meaningful inventions. The psychologist Mihaly Csikszentmihalyi calls this effort to generate a steady stream of ideas the “flow” of creativity [Mihaly Csikszentmihalyi, Flow: The Psychology of Optimal Experience (New York: Harper & Row, 1990). 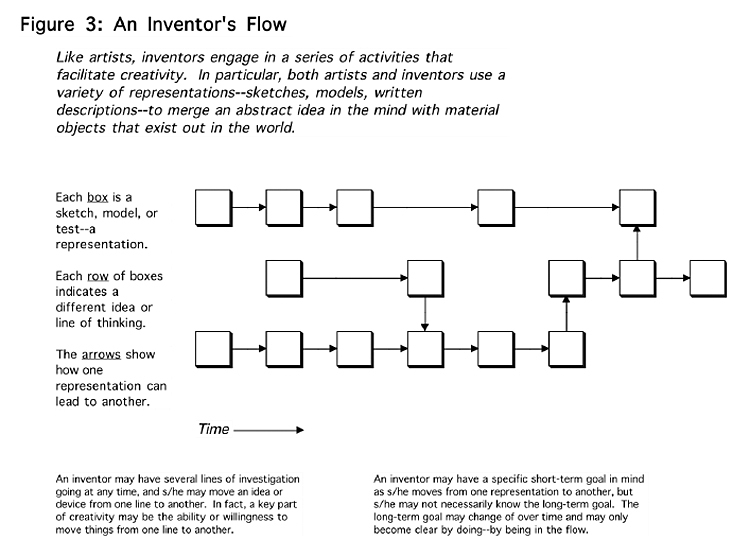 “Developing a Flow Model of Invention,”]. Taken as a whole, mapping the various representations used by inventors gives us a visual picture of the flow of their work. In looking at an inventor‟s flow, it‟s important to consider short-term versus long-term goals. Immersed in the creative process, an inventor may not be worried about the ultimate version of an invention but rather thinking about how he or she moves from one representation to the next. Being in the flow means being focused on the immediate opportunities and open to new possibilities as they present themselves. Along the way, an inventor may change his or her mind about the ultimate goal or the goal may only become clear by doing, by being in the flow. Hence, while it would be tempting to create a map in which everything funnels into what we as historians know is the final version, we should strive to include the ideas and devices that went nowhere, the false starts, and the wrong turns. Suppose now we bring these notions of invention, process and flow, together on a single page. [Figure 4] We will let the process move vertically down the page, with the inputs at the top and the outputs at the bottom. Meanwhile, let‟s have the inventor‟s flow move horizontally across the page. 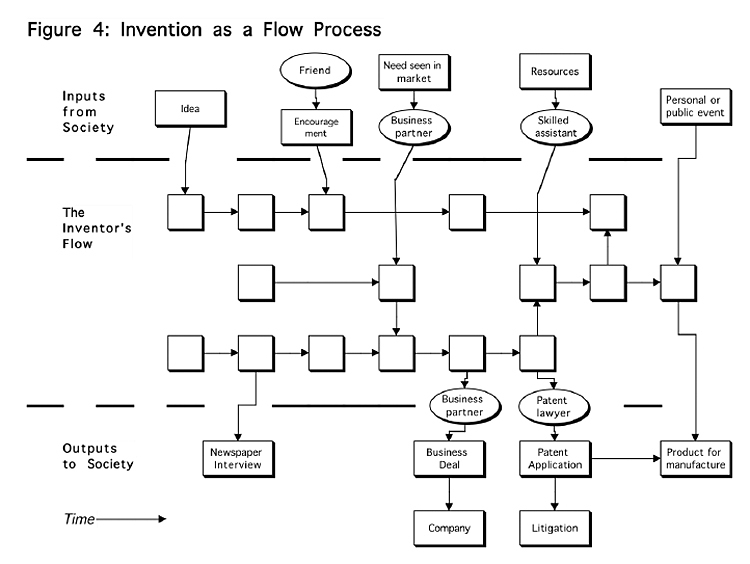 The advantage of this diagram is that we can follow how ideas and resources affect an inventor‟s flow and how things then move out from the inventor‟s workshop into society. For instance, an inventor may learn about an idea on his own. In this case, we would draw a line and arrow from the idea box down to the sketch or experiment box that it affects. In other cases, an inventor learns about an idea from an individual such as a friend, business partner, or assistant, and in these situations, we add an oval showing the person's name. In looking at all of the inputs depicted in Figure 4, it‟s important to note that things are organized in terms of how they are experienced by the inventor and not by some sequence embedded in the model. For example, the inputs—ideas, encouragement, needs, resources, events—should be placed in the order by which historical sources indicate that they affected the invention flow. Rather than squeezing the historical materials to fit into the model, the model and diagrams are modified to reflect what the inventor is doing. We can do the same with regard to the outputs. In situations where a particular version of an invention is reported in a newspaper story or written up in a patent application, we can connect a box in the flow with the appropriate output. Again, ovals are used to indicate the intermediaries such as patent lawyers or business partners who handle the movement of inventions from the benchtop to the wider world. Perhaps the most powerful feature of this diagram is that it shows the intellectual and social work required to convert a benchtop device into a practical invention. Left on their own, inventors often prefer to concentrate on the flow, on moving from sketch to model to new experiment. On the diagram, inventors want to keep moving in a horizontal direction. However, when the time comes to convert a benchtop device into a practical invention, the inventor has to change direction; rather than put his or her energy into generating new variations, he or she has to work on connecting the invention with the wider world via publicity, business deals, or manufacturing. Often, these connections cannot be made by the inventor alone but require the assistance of partners and patent lawyers. On the diagram, the movement of an invention from the benchtop to the marketplace means making a turn from the horizontal to the vertical. Hence, the diagram shows major decisions—where the technical gets connected to the social—as a turn. Thus far, we have been talking about this flow process model in general terms. Obviously, the way you would use this model would be to fill in the details specific to a particular inventor or invention. One would consult an inventor‟s notebooks, sketches, and patent testimony in order to identify all the representations that he or she generated, and these representations would be placed in the boxes in the central portion of the diagram. At the same time, one would use other sources—say letters, diaries, newspaper stories, and business records—to flesh out the inputs, outputs, and the intermediaries involved. The result of filling in all of these details would be to create a rich and comprehensive story about an inventor or invention. Yet we should be clear that the story portrayed in our flow process model might be very different than the story that inventor might tell about how he or she came to create a particular device. 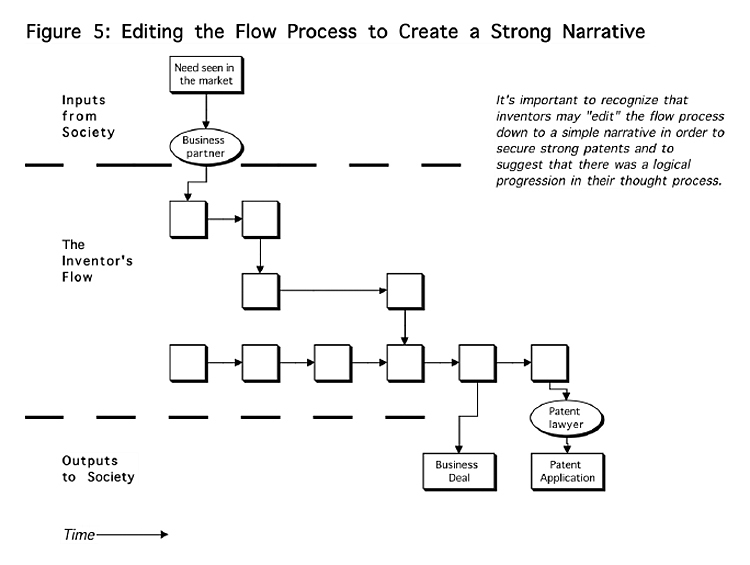 [Figure 5] It‟s important to recognize that inventors may edit the flow process down to a simple narrative in order to secure strong patents and to suggest that there was a logical progression in their thought processes. Moreover, an inventor may simply not be able to reconstruct all the twists and turns that he or she took on the way to a particular outcome. Edison, for instance, introduced hundreds of sketches of the telephone as evidence in patent litigation in the late 1870s, but in testifying he was hard-pressed to explain how he moved through this entire corpus of work. And finally, inventors often use one version of a device in order to create the next. As a result of this cannibalization, the evidence needed for the intermediate steps may not be available when it comes time to construct a narrative of the creative process. Summary: What are we trying to capture with this model? It is important to note that this model is not intended to be restrictive, that “one size fits all inventors.” Indeed, the point of the model is to draw out what is unique and special to each inventor. The model serves to help us ask consistent questions across different episodes of invention. It should push us to identify and collect those materials that reveal both the social and cognitive dimensions of the creativity. Ideally, this model should permit us to capture more of the details of the invention process and allow us to construct richer narratives of how inventors combine ideas and objects and merge the technical with the social. This model should help us not only to understand successful inventions but also the dead ends and ideas that fail. But above all, a new model should enlarge our vision of what invention is and challenge us to understand better how people can create remarkable technology that changes the world.